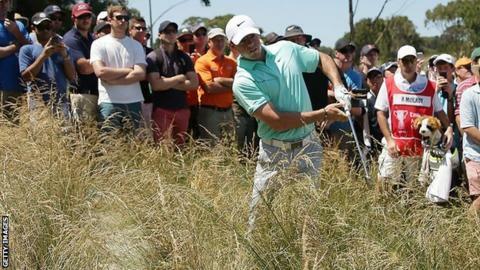 Defending champion Rory McIlroy is six shots off the lead at the Australian Open after a five-over third round 76. The Northern Irishman, one shot behind overnight, dropped five shots in two holes to lie 14th on one over. McIlroy said: "I need a fast start on Sunday to have a chance. It depends too on what the guys ahead of me do." American Jordan Spieth shot a two-under-par 69 to join Australian's Greg Chalmers (71) and Brett Rumford (69) at the top of the leaderboard. World number three Adam Scott (69) and Rod Pampling (69) are one off the lead. Despite being joint leader on level par after eight holes, McIlroy's round fell apart just before the turn. The world number one found the rough on the ninth and struggled to dig his way out en route to a triple bogey seven and he then made a double bogey six at the 10th. McIlroy added: "It was a tough day obviously. The wind was up. I was doing okay, steady enough, until I got to the ninth. I hit a wayward tee shot into what I thought was a decent enough lie that I could advance the ball. Brett Rumford likened playing conditions to "pedalling a million miles an hour going nowhere"
He birdied the 11th but two more bogeys, at the 13th and 16th, dropped him further back. A birdie at the last meant the Northern Irishman at least ended on a positive note going into the final round in Sydney. He added: "I still feel like I can shoot a good one. I just don't know if that will be enough. I'll be trying my best. It's the last round of the season so it would be nice to make it a good one." Joint-leader Rumford claimed the course was almost unplayable as blustery conditions contributed to only eight players being under par in the tournament. He said: "The course is on a razor's edge as they are trying to create a golf course that's as unplayable as they can get it without it being so and it's right on that point," Rumford told reporters. "It's tough, I'm certainly not saying it's easy. You seem as though you are pedalling a million miles an hour going nowhere."